In this chapter we will make the connections between aircraft performance and propulsion system performance. 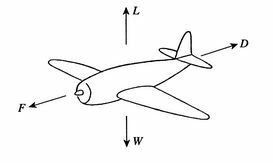 For a vehicle in steady, level flight, as in Figure 13.1, the thrust force is equal to the drag force, and lift is equal to weight. Any thrust available in excess of that required to overcome the drag can be applied to accelerate the vehicle (increasing kinetic energy) or to cause the vehicle to climb (increasing potential energy).